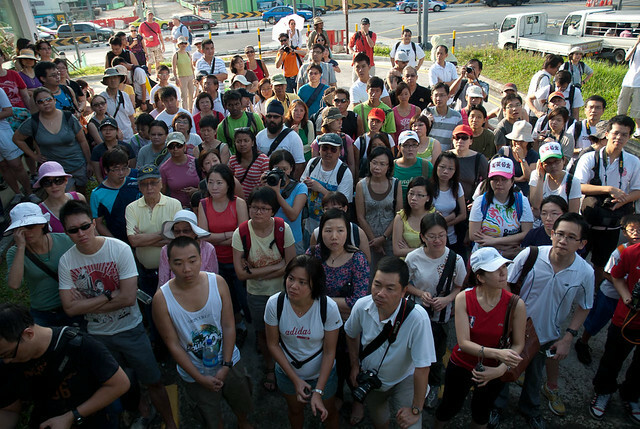 Jerome talking to the 100+ participants of the walk from Rail Mall to Bukit Panjang level crossing. 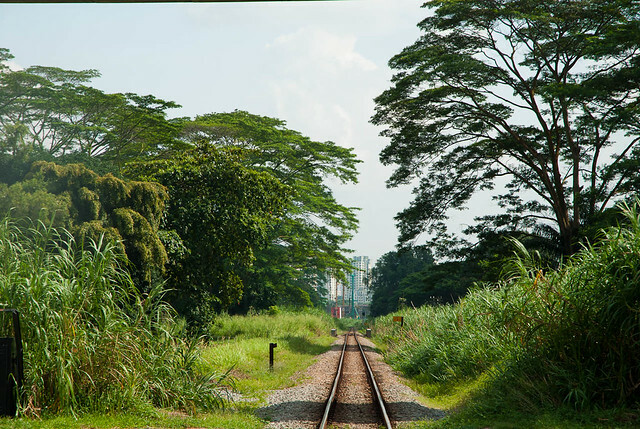 Not long after we started walking away from Rail Mall, we heard the train horn as a southbound train passes the truss bridge across Upper Bukit Timah Road. Everyone stopped and took photos as it passes. We soon arrived at Hillview Road where there’s a small girder bridge spanning across. Outside the Standard Chartered Bank, Jerome tells us about its history as well and it being a landmark in the early days. 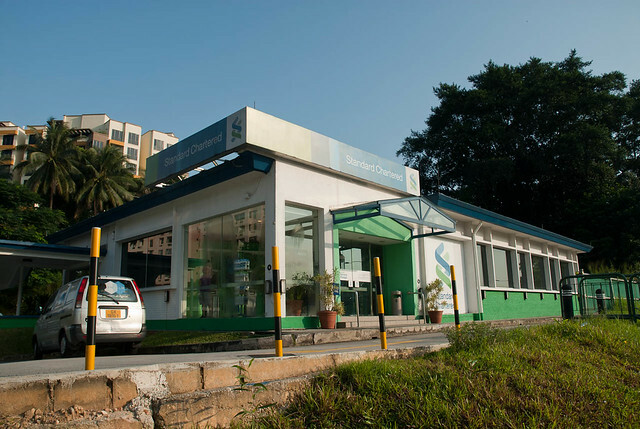 The Standard Chartered Bank at Hillview Road. Another view of the large crowd which turned up for the event. 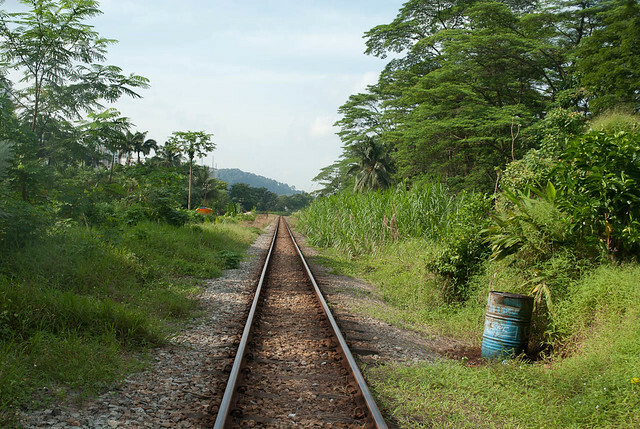 Having been appropriately reminded to keep off the tracks and to keep a safe distance of at least 3m away, we proceeded to explore the railway track. We were lucky to see a train whiz by shortly later. Participants getting ready to shoot a passing train from the Hillview girder bridge. 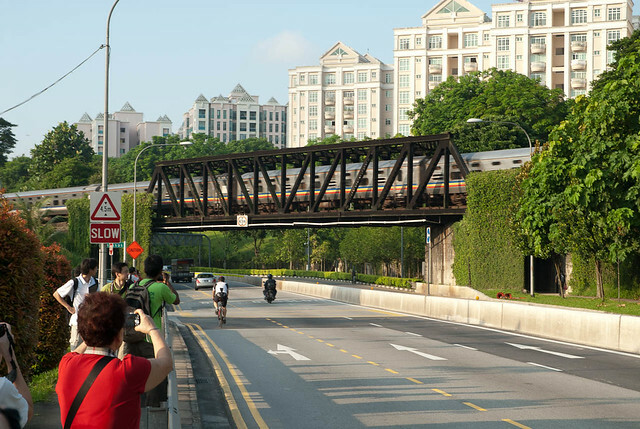 The train driver waves to the walk’s participants as it passes by after crossing the girder bridge across Hillview Road. 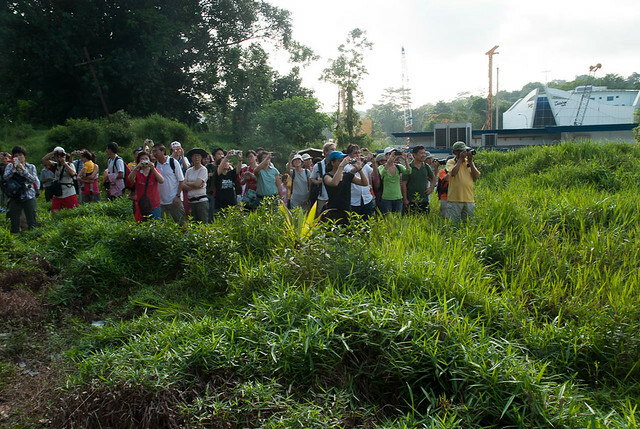 The area is surrounded by lush greenery, the very one which the Nature Society of Singapore’s Green Corridor proposal is lobbying to preserve. 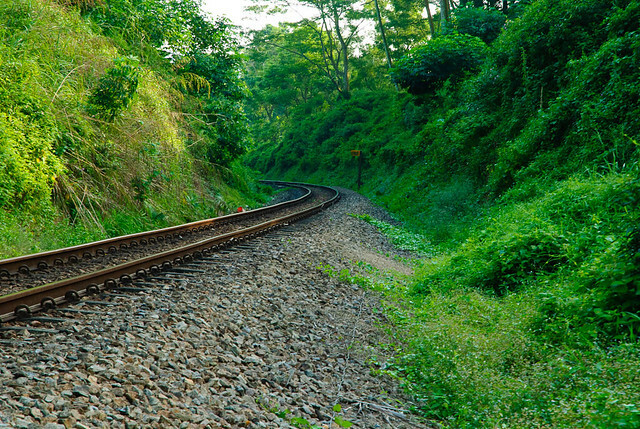 The lush greenery near the girder bridge at Hillview Road. Further along, we heard the horn of an approaching train and quickly moved aside while it passed us. This is the 3rd passing train that morning and we were all happy to have caught it on camera, possibly for the last time for many of us who has to work the following week. A short while later, we saw the railway signal and a sign indicating a level crossing at Gombak Drive. 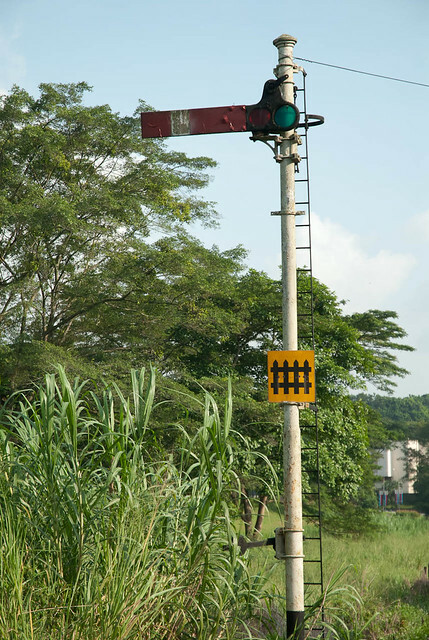 A railway signal and a sign for the level crossing at Gombak Drive. 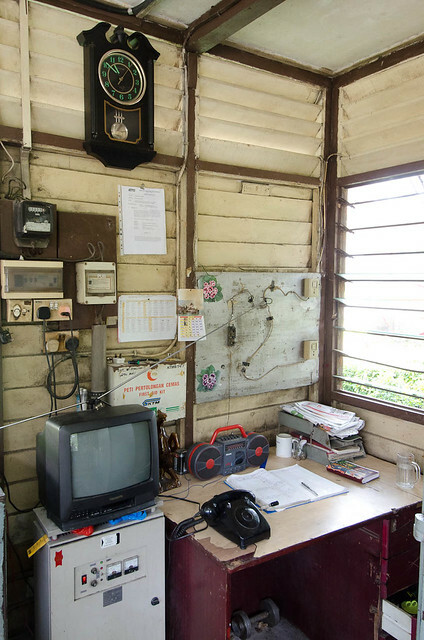 Unlike the previous walk we did, this time the gate operator at Gombak Crossing, Mr. Ramlan was very nice and allowed us to take photographs of his control hut. I asked his permission to have his portrait taken and he gladly obliged. 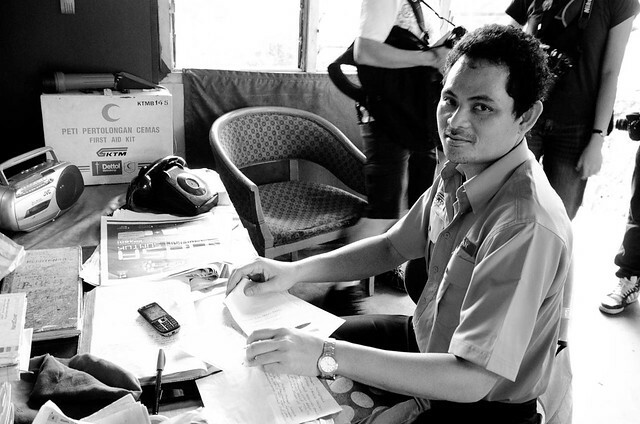 Mr. Ramlan, gate operator of the Gombak level crossing at his desk. 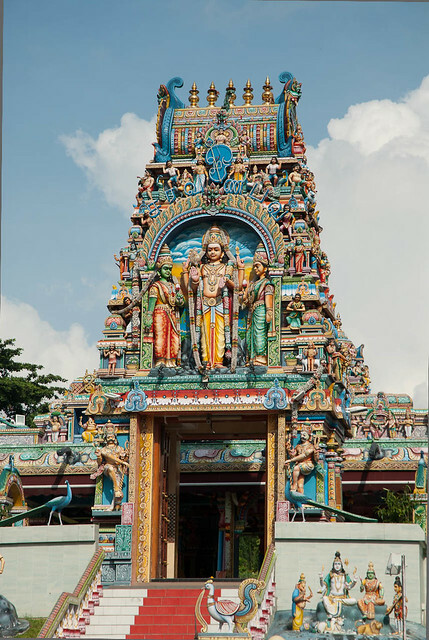 Continuing along, we came across the Murugan Hill temple, which was located here in 1992 from its original location at Sungei Tengah. Nearby is and old style overhead bridge, a design which I have not seen for years. Apparently it was recycled from an old overhead bridge and placed there as a temporary crossing while the construction work for the downtown MRT line is going on. 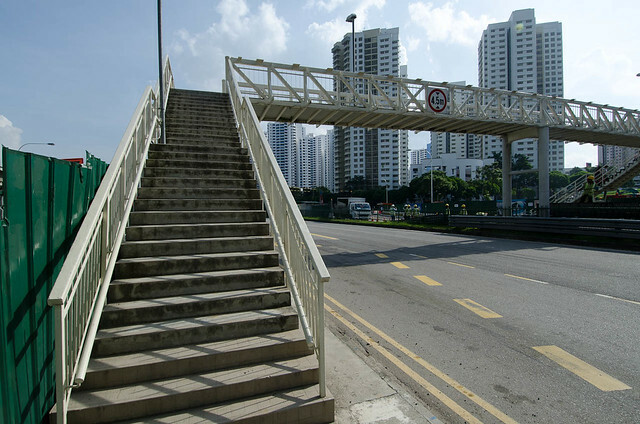 An old-style pedestrian overhead bridge. 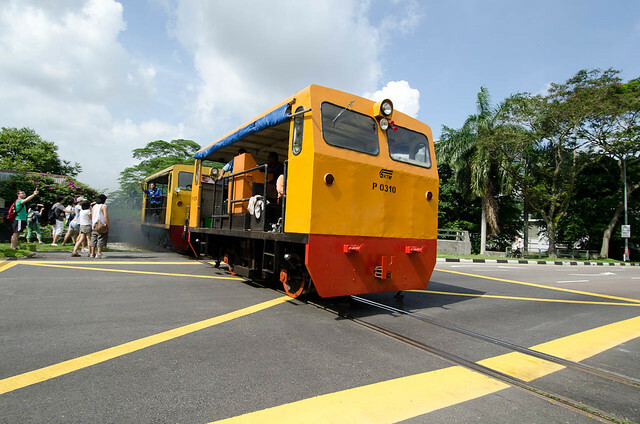 Finally, we arrived at the Bukit Panjang level crossing – the widest in Singapore, cutting through the 6 lanes Choa Chu Kang Road. 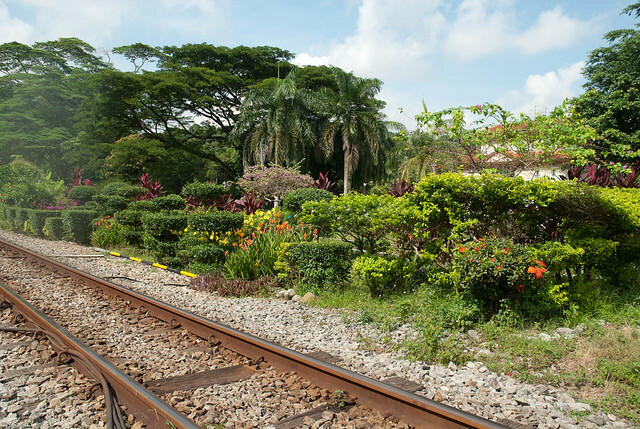 The site is also near where the Bukit Panjang Railway Station used to be, and it’s this station which if I recall Jerome correctly, where the 1st train towards Tanjong Pagar Railway Station departed from. On that day, it was manned by Mr. M. Manikavasam who has worked for KTM for 27 years. He also gladly allowed the hordes of participants to take photos around and in his control hut. 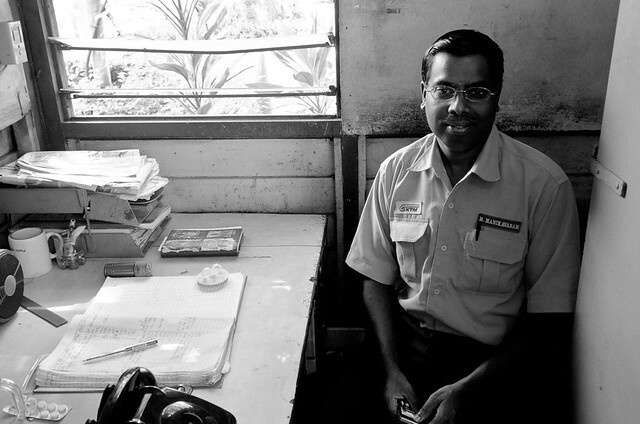 Mr. M. Manikavasam, the gate operator at the Bukit Panjang level crossing. 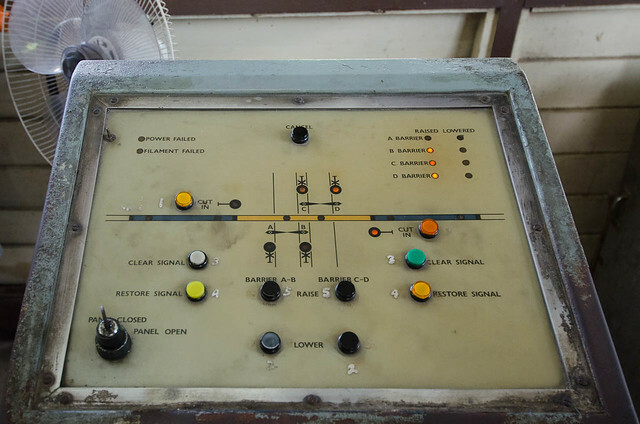 The control panel used to control the barriers at the Bukit Panjang level crossing. 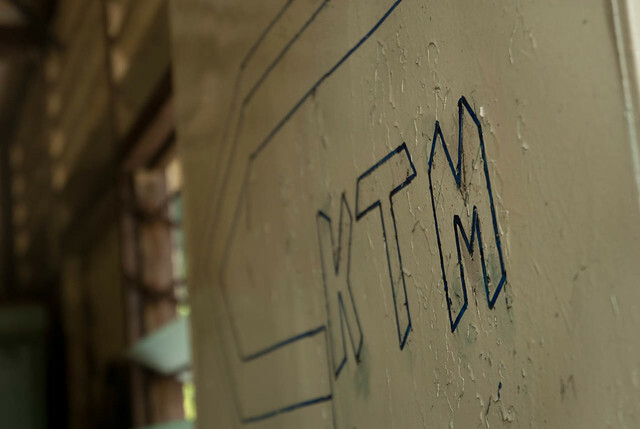 Interestingly, this control hut as a hand-drawn KTM logo on its door. Perhaps one of the operators was bored and decided to express his artistic side. 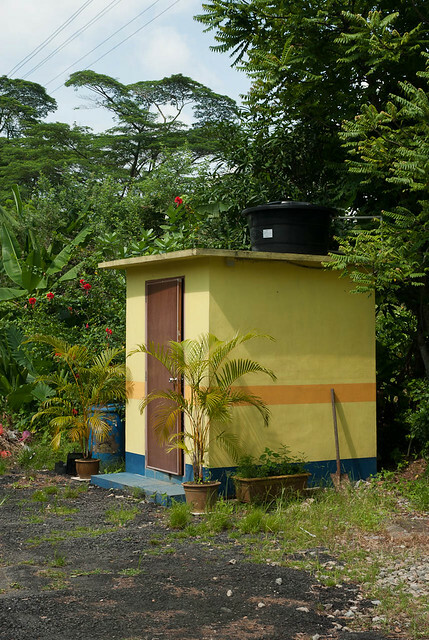 Like the other crossings, the Bukit Panjang crossing also features an outhouse painted in yellow beside the control hut. The outhouse at the Bukit Panjang level crossing. The crossing is surrounded by lush greenery, something which we don’t see much in the rest of Singapore. I can see why the Nature Society is lobbying for its preservation via the Green Corridor proposal as it’d be a waste to see them go and get replaced by a concrete jungle. 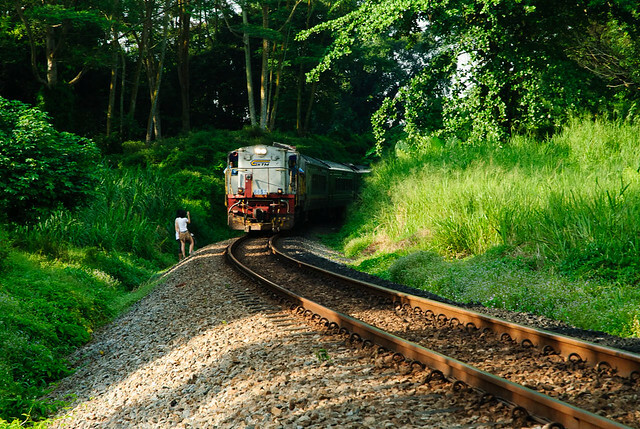 Soon we got news that a maintenance train will be passing by and everybody got ready to get a shot. It’s always intriguing to see a train pass by a road via a level crossing, where all the traffic will stop to let it pass. 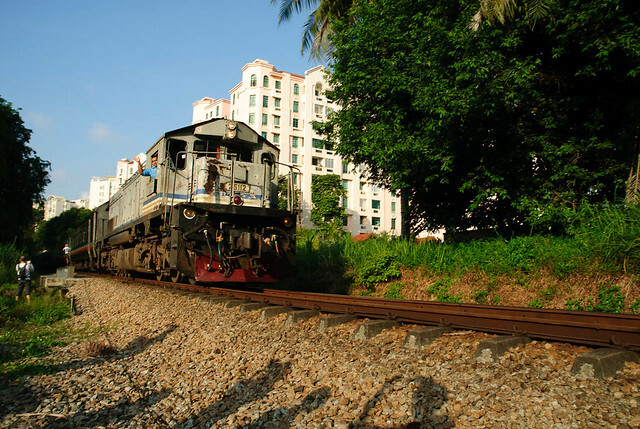 A KTM maintenance train crosses the Bukit Panjang level crossing as visitors take photos of it. And that concludes the last walk (at least for June) by the We Support the Green Corridor Facebook Group. You can read the Green Corridor proposal by the Nature Society here. Do give them your support by “Liking” the Facebook page.